The countdown to Christmas has reached a critical point: T minus four days, and counting. In the last minute scramble for things Merry and Bright, the essence of Christmas can sometimes be lost, buried under so much tinsel. 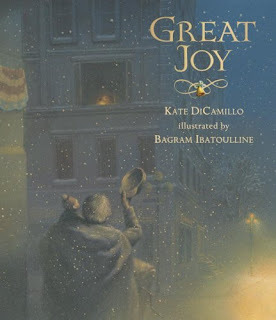 Kate DiCamillo's story of homelessness, charity and great joy is a gorgeous and poignant reminder for parents and a wonderful introduction for children. Glowing illustrations by Bagram Ibatoulline will warm you and yours on the coldest of nights. "Great Joy" reminds us what joy really is, and how capable we all are of giving the gift of joy to one another.